The views of this guest poster do not necessarily reflect the views of the blog host. It’s my pleasure to have my friend Eréndira Ramirez-Ortega on the blog today! 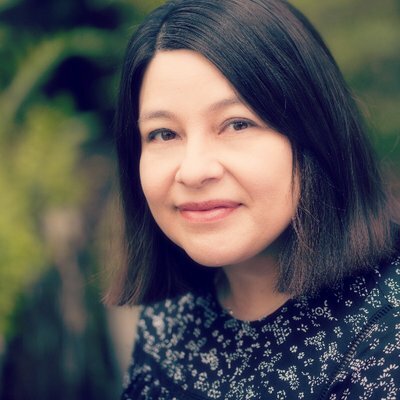 Eréndira has published fiction in Day One, The Cossack Review, The Black Warrior Review, and others. I attended public school and thus began publishing my short stories in the general market. While I was in the MFA at Mills College in the ’90s, I never used quotation marks in my fiction. Literary journals sponsored by universities across the US published my short fiction and didn’t question my excising of quotation marks. Perhaps because they read Saramago, or possibly Cormac McCarthy, notorious for excising quotes. The boy didn’t answer. He just sat there with his head down, sobbing. The boy said something but he couldn’t understand him. What? He said. In this excerpt, the characters’ lines of dialogue are separated by line breaks. Who is speaking is declared also by association with an action from said speaker. I’d become so accustomed to excising quotation marks that the question at the conference caught me by surprise. It seemed there was a notable disdain for this style of writing. Personally, I believe that omitting quotation marks in dialogue makes the prose spare and lean. In stream-of-consciousness narrative, it moves the story forward at a smoother pace. I had read enough works of fiction like McCarthy’s that I was convinced this style was the right choice for my own writing. I gave myself permission to break from the convention. I didn’t get much push-back in the MFA when I introduced my writing during workshop. Some students told me it felt odd. However, my allies in the class mentioned that dialogue without quotation marks kept the characters in the work closer to the narrative. One ally said she had to work a little harder when she read my work, which was a compliment in our MFA circle. Another said I didn’t hold my readers’ hands. Don’t expect Eréndira to spoon-feed you when you read her work. Eliminating quotation marks in a work of fiction invites the reader into a deeper level with the voice of the narrator. It enhances the experience of entering the world of the story and storyteller. Some readers may not be ready to journey through unconventional typographical styles from emerging prose writers. That’s fine. I can read a great work littered in quotation marks and find the experience wonderful. But I believe that the omission of quotation marks in a work of literature deserves consideration. The full version of the above post can be found here. I use this style occasionally, but only briefly, and usually not paragraphed, but lined up all in the same block, when I’m more narrating than actually quoting. I think there is room for it, but probably better for a short story? I think I am usually writing a humorous, casual, or even slouchy piece, or else venturing into near unconscious stream of consciousness type of work when I apply this un-convention, but I’d have to look over a lot to be sure. Most of the time, I’m not aware of dropping quote marks until a reread. There are definitely times, in my opinion, when quote marks are more than unneeded, when they are in the way of what is happening on the page and in the reader’s experience. But I would not adopt it as a trademark. Completely agree, Katharine. I think they do get in the way of what is happening on the page and when readers adopt that sensibility, the story is most engaging and inclusive. It is challenging to put into words, but the thoughts are there.